After a sunburn, a thin layer of skin may flake or peel off from the damaged area. The peeling usually starts a few days after a sunburn and may continue for about a week. While a sunburn itself is painful, peeling typically is not as the shedding skin is dead. However, peeling after a sunburn is a sign that significant skin damage has occurred and is in the process of healing. The sun emits ultraviolet radiation, often called UV radiation. Depending on a person's total exposure time to the sun and baseline skin color, this type of radiation damages exposed skin cells. In some instances, the top layer of skin responds to UV radiation by becoming darker and thicker as a protective response. However, UV radiation can cause harsher skin damage, killing the exposed skin cells and producing a sunburn reaction. Sunburned skin appears red and is typically painful. The area damaged by UV radiation heals by forming a new layer of skin to replace the dead skin layer. Underneath the sunburned skin, new skin cells form to replace the sun-damaged skin. The new layer typically takes about 4 to 7 days to fully form. Throughout the process of formation, the new skin layer is delicate, and thus remains shielded by the intact dead outer layer of sunburned skin. When the freshly formed skin cells mature to the point of becoming resilient enough to function as the outer layer of skin, peeling of the dead outer skin layer occurs. Sloughing of the dead skin occurs gradually. If you peel the dead skin before it comes off on its own, you may expose a new layer that is still delicate and fragile, triggering tenderness or bleeding. 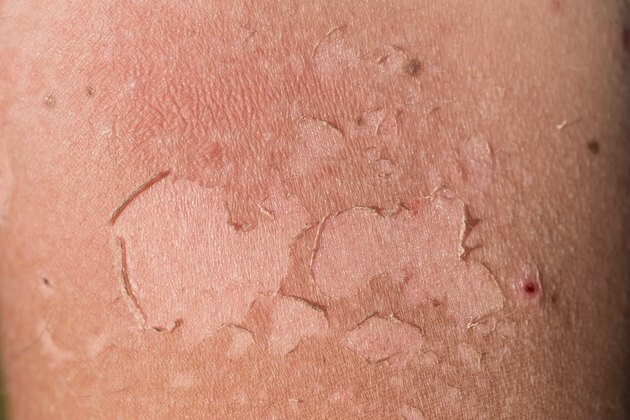 After the new skin layer is completely formed and the dead skin peels off, the discoloration of the skin -- a tan -- may remain for weeks to months. The dark coloring gradually fades, a sign that the skin is refreshed and all of the skin cells directly affected by UV radiation have been replaced. However, sun exposure often causes imperceptible damage to the genetic material, or DNA, of the skin cells. In this way, even skin cells produced years after a sunburn may carry damage that can result in problems such as an aged appearance of skin or cancer. Although most sunburns heal on their own with simple home care, severe burns from either the sun or a tanning bed may require medical attention. See your doctor as soon as possible if you experience a sunburn that leads to the formation of skin blisters or is so painful that you cannot function normally. VisualDx: Essential Adult Dermatology; Noah Craft, M.D., Ph.D., et al.